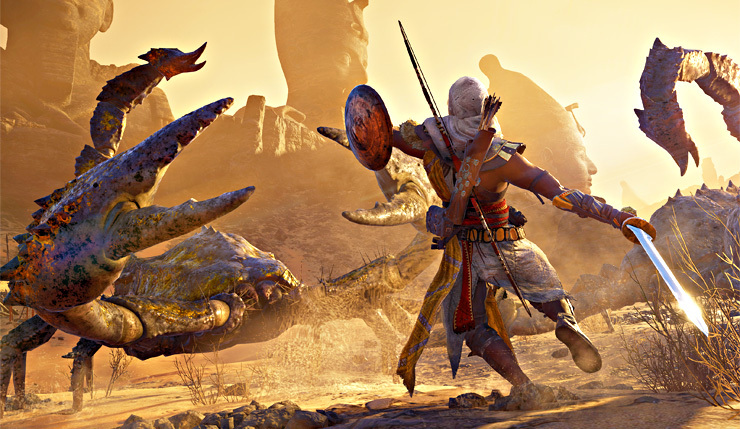 Assassin’s Creed Origins is a huge game, and it will get even bigger post-launch thanks to an ambitious slate of add-on content. This DLC includes a paid season pass, which contains two full story-driven expansions, and a variety of free modes available for all players. You can check out a trailer for Assassin’s Creed Origins’ post-launch content, below. DLC 1 – The Hidden Ones: This story-driven expansion builds upon the growth of the Brotherhood, taking players to a point years after the events of Assassin’s Creed Origins, as they clash with an occupying Roman force in a new region. This expansion will extend the level cap, allowing players to keep on making their character progress. Available in January 2018. DLC 2 – The Curse of the Pharaohs: In this story-driven expansion focusing on Egyptian mythology, players will fight against undead pharaohs and explore a new, mystical realm. During their journey, players will encounter famed Egyptian beasts such as Anubis warriors, scorpions and more, as they investigate the cause of the curse that has brought the dead pharaohs back to life. The Curse of the Pharaohs will increase the level cap further and introduce brand new Abilities. Available in March 2018. The Roman Centurion and Horus Packs: Two exclusive add-on packs including a new outfit, weapons, shield and mount. Available in November 2017. The Assassin’s Creed Origins Season Pass is included in the $100 Gold Edition of the game, or can be purchased on its own for $40. Assassin’s Creed Origins sneaks onto PC, Xbox One, and PS4 on October 27th.